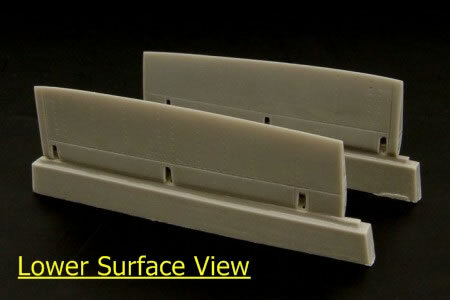 BRL48021: 1 x Resin part, PE fret & instructions. 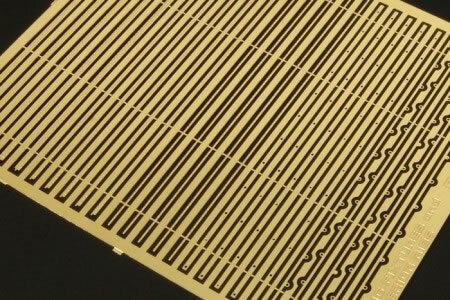 BRL48024: PE fret & instructions (2 pairs of chocks). 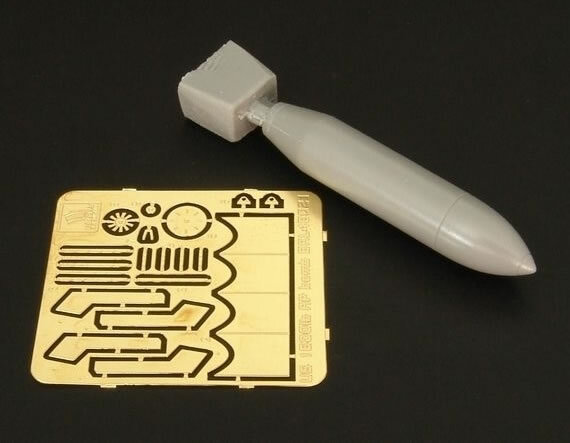 BRL48025: 2 x Resin parts & instructions. 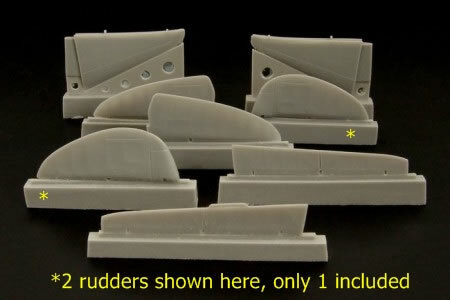 BRL48027: 7 x Resin parts & instructions (the photo on Brengun’s web-site shows eight parts as for some reason two rudders are displayed). Very good quality production. 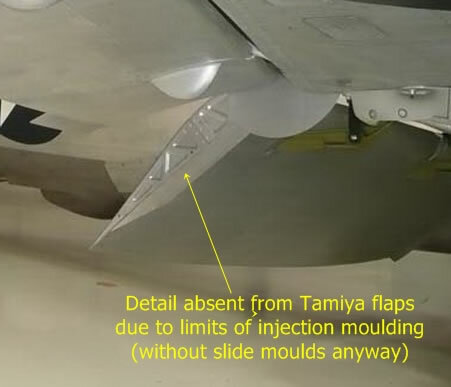 The P-47 flaps correct a small tooling compromise with the Tamiya kit when lowered flaps are depicted, as well as providing some additional detail. The MiG-3 control surfaces are a big improvement on the kit parts. I assume that a real 1,600 lb bomb would have various markings on it. The lack of a painting guide and decals therefore seems a pity. All the items are very well produced. The bomb would be a better package if it had a painting guide and decals. The wheels chocks are fine and simple diorama aid. 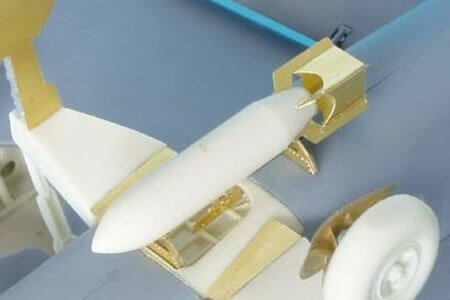 The P-47 flaps provide two small improvements over the Tamiya kit items. The MiG-3 control surfaces are huge improvement over the kit items, and are worth buying even if you do not plan to displace the control surfaces. The accessory sets reviewed here each come in a cellophane bag stapled to a card header. The simpler sets are without instructions, whereas the others have them, although these are fairly basic. I have used Brengun’s own images from their web-site as I would not be able to improve on them, and in some cases illustrate the assembled item which is often more informative than an image of a PE fret alone. A very convincing and detailed bomb should result from this set. However I think that this weapon would have markings, so it’s disappointing that there is no painting guide or decals. If I’m right about markings on the real bomb then this is quite an oversight in this scale. This set offers a series of different texture straps and reinforcing bands with varying widths. They are very fine and will need some care when removing from the fret and cleaning up any remaining brass tags. The parts are generic in nature, but super-detailers will no doubt find uses for them as intended, as well I should think in a number of other applications. Two pairs of chocks to add interest to any 1/48 WW2 Luftwaffe vignette or diorama. 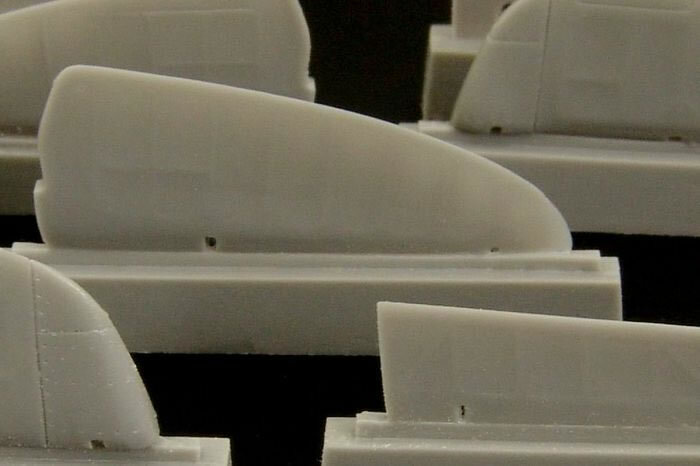 The main benefit over the kit parts appears to be some fine structural detail on the ends of each flap when viewed from the side looking at the airfoil cross section end-on. 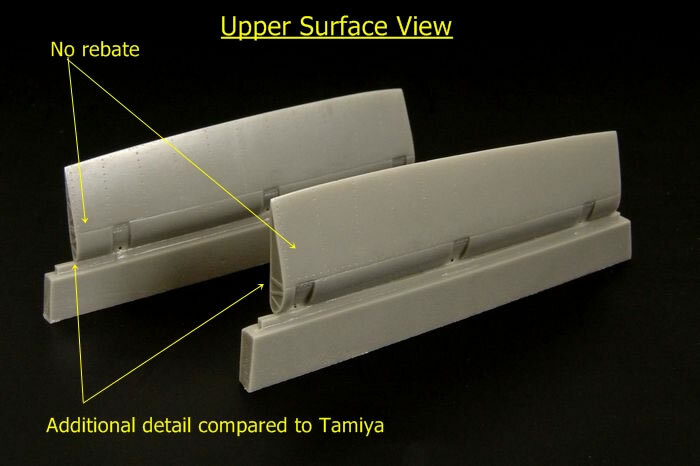 However closer examination reveals that the resin flaps lack a shallow rebate present in Tamiya’s flaps to permit them to close under the fuselage whilst remaining flush with the wings upper surfaces. 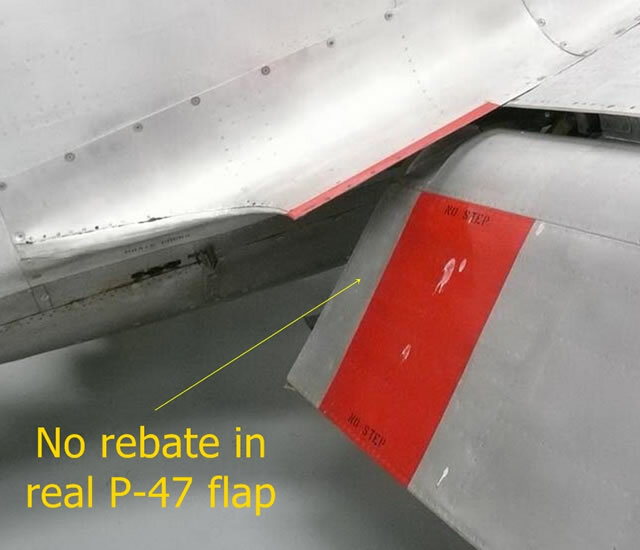 This is not a feature of the flaps on a real P-47, and I think it is a small compromise by Tamiya to avoid having to tool two different flap upper surfaces for their kit; one to fit flush when the flaps are up, and the other to be strictly authentic when they are lowered. The accompanying photos illustrate my point. So well done Brengun for correcting this aspect for lowered flaps. 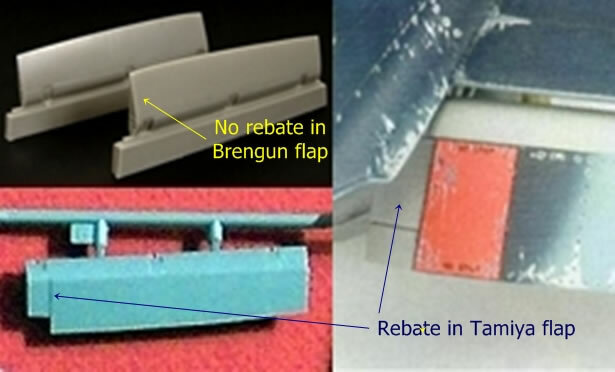 Of course this small tooling compromise by Tamiya can be easily rectified for lowered flaps with some thin plastic sheet, but the additional end plate detail on Brengun’s flaps would take far more effort to depict. The kit’s control surfaces look absurd with large raised bulges presumably representing rib tapes. Brengun’s resin replacements are far more refined, and very delicately executed. Some may choose to just sand off the lumps on the kit surfaces and depict the rib tapes with decal strips, but if you want to displace more than just the ailerons (the only separate control surfaces in the kit) then the resin replacements are a most worthwhile option. In fact the Brengun items are recommended if even if you don’t wish to displace the kit’s tail control surfaces because they are so much more refined and realistic than the kit parts. These are all very well produced accessories, although I believe that the 1,600 lb bomb is let down by a lack of a painting guide and decals for bomb markings. 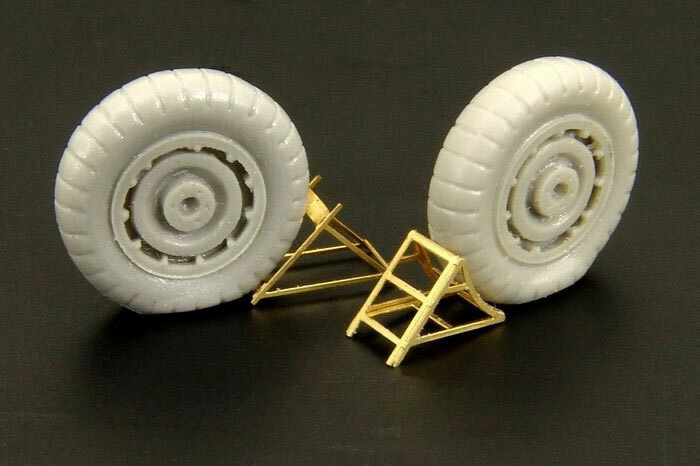 The Luftwaffe wheel chocks are a simple aid to add interest to a vignette or diorama. The P-47 flaps at first seem to offer a very modest gain over the kit parts in detail terms, but further checking revealed that they also correct a small tooling compromise by Tamiya. The MiG-3 control surfaces are a vast improvement over the crude kit items, and well worth buying if you wish to displace the tail control surfaces, or indeed even if you don’t. All of the items reviewed here are recommended despite some niggles regarding the bomb.